Stan Stringer has been a major contributor to the development of this community history Web site of Lincoln, Illinois, from early on. In December of 2004 he provided information about his father and grandfather. Early in 2005 he sent me accounts of two 1932 major fires in downtown Lincoln, including a dramatic photo of the first fire taken by his father, Charles Stringer, a professional photographer. Stan's reports on the 1932 fires and his contemporary photos of the reconstructed buildings show a most fascinating blend of old and new photos and informative writing based on research using microfilm copies of the Lincoln Courier, memoir, and oral family history. Stan's material is especially significant because it explains and depicts key features of the present-day Logan County Courthouse Square--on the National Register of Historic Places. Accordingly, I have devoted this Web page to Stan's new material (and some of his previous material, too). The information about his grandfather also appears on the page for the Lincoln State School (later the Lincoln Development Center). Later on this page I provide links to other pages in this Web site that contain additional stories and photos from Stan Stringer. I know I speak for all who visit this site--especially for us Lincolnites at Heart--we are most grateful for Stan's remarkable photos and stories. Respond to Stan at sstringer@cox.net. The following is a short story about my grandfather, Henry Stringer, who taught brush making at the Lincoln State School and Colony from the l890s to the early 1920s. Also attached is a picture of my grandfather, another teacher, and a small group of their pupils and a second picture that includes brushes that were made at the school. In 1880 Henry Stringer immigrated to Chicago from Walsall, England. 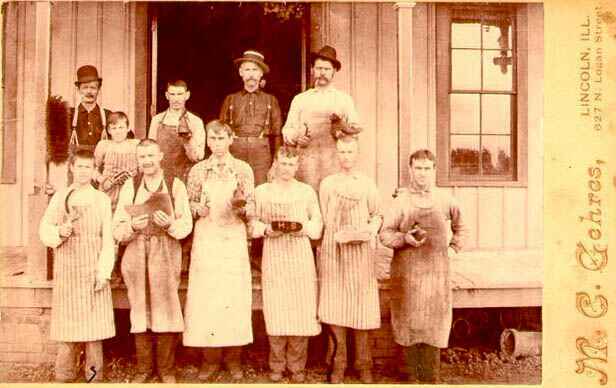 Walsall is famous for the manufacture of saddles and other gear for horses and their care. When Granddad came to this country, he and my grandmother already had four children. Initially the plan was he would find work here and then send for the family. Unfortunately, he was not a good money manager, and after the second year of waiting grandmother arrived while the children waited in Walsall with an aunt. After sufficient money was saved for passage, the aunt with her children and my grandparents’ children came to the states. I’m told by my cousin, Loren Stringer, that grandfather attempted to establish a brush making shop in Chicago, but he was burned out twice by the unions. Labor relations were rough and tumble in those days. Sometime in 1894 or the following year my grandparents moved to Lincoln, and Granddad became a brush making instructor at LSS&C. The residents of LSS&C varied in the individual capacities and dispositions, and while some might receive training, others were totally unsuitable for it. Regrettably, not all of the residents really belonged in the institution. Occasionally, a resident had been committed to the institution who really should have been left in society. The explanation that I heard for this had to do with the juvenile court system. If the parents were influential, the judge might direct the juvenile to LSS&C rather than prison. To compound matters, the youngster might be ignored and forgotten by the family. Today, we would recognize this as the “thrown away child” syndrome. Occasionally, Granddad would get such a boy in his shop. When this happened, Granddad would help the boy gain basic civil skills, which included following directions. After the boy was 18, Granddad provided the young man with enough money to buy a train ticket to St. Louis with the instruction to enlist in the army. Was the army a good recommendation? Yes probably. By eighteen the young man was conditioned to being institutionalized. It could further transition to a free life. Unfortunately, not all residents were docile; shortly before retirement one boy became quite angry with granddad and clubbed him aside of his head. Granddad suffered a severe vision problem in one eye after that. The second picture includes some mementoes of Granddad’s. The top left brush also bears the initials “HS.” The box in the upper right is a puzzle brought from England. The history of the gavel is unknown other than it was Granddad’s. 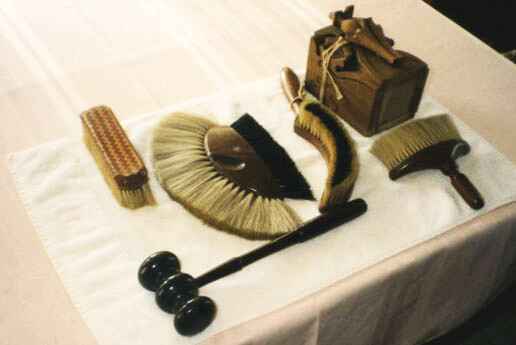 The large semicircular brush is a clothes brush. The curved brush is for sweeping crumbs from the dinning table. The remaining brush is also a clothes brush. I trust you find the story and pictures interesting. Merry Christmas and the best in 2005. Probably taken in the early 1920's at their home on Adams Street. The Stringer Studio was established by Charles M. Stringer after returning from World War I. Charles was the youngest son of English immigrants, Henry and Jane Stringer. They had immigrated to Chicago from Walsall, England, in the 1880’s, and later moved to Lincoln in 1895. In Lincoln, Charles completed the eighth grade, and he wanted to proceed to high school, but his father, Henry, insisted it was time for Charles to find work. Henry had only attended school through the 2nd grade before he had to begun working, and he thought an eighth grade education quite sufficient. Charles first found work making deliveries for Reed’s drugstore, but later changed jobs to work for Charles L. Venard, owner of the Venard Studio, at 526½ Broadway. There he learned to print and develop photographs along with other chores. In time Charles felt he should continue his "informal apprenticeship" with another photographer. He first contacted a photographer in Peoria, who he thought would hire him. As he would later say, the photographer looked him up and down, and told him he wasn’t interested in hiring him. "I must not have inspired much confidence. I looked awfully young, and I didn’t weigh more than 125 pounds." Charles continued his search for a new job, and in 1914 he was hired by Felix Schantz, a photographer in Fort Wayne, Indiana. With Schantz, Charles learned more about the photography business including sittings and advanced printing, retouching, coloring and other techniques. 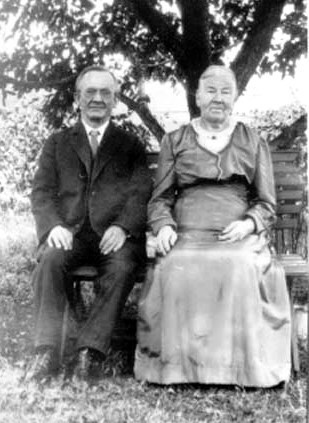 While in Fort Wayne he met his future bride, Virginia Hazel Hall. After U.S. entry in WW I in 1917, Charles, like many other young men, was inflamed by the many false Hearst news stories of German atrocities in Belgium and France, and he enlisted in the Army. He was assigned to the Signal Corps newly formed 91st Aero Squadron. The 91st trained at Kelly Field, Texas, in the summer of 1917. The squadron sailed in late October 1917 and reached France in mid November. The 91st Aero Squadron conducted observation flights over enemy lines from Verdun to St. Mihiel Salient (the eastern terminus of the battle line). While over enemy lines, photographs were taken. Aerial photographs were used to assess battlefield entrenchments, obstacles and enemy troop dispositions. Charles rose to sergeant in charge of a darkroom team. Charles estimated the squadron’s photographic section developed 3,700 negatives and printed 370,000 photographs from May 29 through November 11, 1918. He never flew on such missions, but on occasion a pilot would give him a ride over friendly territory. After the Armistice, the Rhineland was occupied by the Allied armies, and the 91st Aero Squadron was stationed in Coblenz, Germany. Stan says the photo dates to 1919 after his father returned from Germany; the photo was perhaps taken by the Schantz Studio, Fort Wayne, IN. In April 1919, Charles returned home to Lincoln. The night of his arrival, Charles was told that his mother, Jane, was dying. She was a diabetic, and the doctor told the family that she was dying. Charles went in to see his mother, and afterward he went to bed with the understanding that, when the end was near, he would be awakened to be present when she breathed her last. The following morning Charles awoke and went down to see why he had not been awakened before his mother died. To his surprise he found his mother preparing breakfast for him. Apparently his safe return had stimulated her pancreas, and this accounted for her recovery. Jane survived this event to live for another 6 years before succumbing to diabetes. In October 1919 Charles married his pre-war sweetheart, Virginia, and returned to Lincoln to establish his photography studio. The studio was located on the second floor of the Bates Building on the northwest corner of Broadway and Kickapoo Streets. At first the young couple lived in the building while the business was getting started. Later they purchased their home at 912 Pekin Street. Lincoln, a thriving farming community, had many needs requiring a professional photographer. At the studio individual portraits and group photographs were taken. The latter included photographs for weddings and confirmations. Charles also took commercial photographs for local businesses such as the Casket Company. He also photographed the dismantlement of the Postville Courthouse for the curator of the Greenfield Village. Dad sold his photography business in 1947 or 1948 after developing an allergic reaction to the chemicals used in developing film and prints. We left Lincoln in October 1949 for Ft. Wayne. For me the time from November 1949 through spring 1950 was a hard transition. For those 8 months I attended a country school. The following year I attended Ft. Wayne Central High School, an urban school. It seemed to fit me well. My junior year I was art director for the year book and senior year I was editor. We had an excellent advisor. I don't remember who the organization was that evaluated yearbooks, but we received the top rating of "All American." As it turned out that was the school's last yearbook to be so rated. Central High no longer exists as a public high school, but the building was renovated, and now is GED teaching school. Leigh's note: "If the oceans could be drained, all of the islands would be connected" (Moses Judah Folkman, Harvard University). Charles Stringer photographed four generations of my family. In addition to my second birthday portrait above, other portraits were taken of my Uncle Gib Wilson on his high school graduation in 1946; Gib's parents, Harrison Franklin Wilson and Blanch Hoblit Wilson, on their Silver Wedding Anniversary in 1945; and Blanch's parents, John and Ida Yenter Hoblit, in 1946 on their Golden Wedding Anniversary. John and Ida were the parents of Fireman George Hoblit referred to later on this page. Preceding the millennium year 2000, the Springfield State Journal-Register published a series of stories on events in Illinois during the preceding century. The stories were good, and the Jan. 9, 1999, story revisited Lincoln’s loss of the Postville Courthouse to Henry Ford’s Dearborn Village. Regrettably, the headline seemed a bit pejorative — "Ford wanted Lincoln landmark more than Lincoln’s people did" — and I felt there was some injustice in this. While the story makes clear that Lincoln had an opportunity to preserve the building and Logan County Judge Lawrence Stringer (no relation to the writer) sought to create interest in this, no one came forward. In 1929 Henry Ford purchased the courthouse for inclusion in Dearborn Village. His conservationist hired my father, Charles M. Stringer, to photograph the disassembly of the courthouse. As my father told me, when Ford bought the courthouse, it was rented to a poor family. Ford generously brought the family to Detroit, and Ford Motor Company hired the father at the wage of $5 a day. While this now seems pitifully small, in 1929 and during the Depression it was top dollar for factory workers. As the courthouse was disassembled, each board and timber was marked with a number so that each piece would be in its same place when reassembled at Dearborn Village. The conservation effort went so far as to save the original plaster, which was ground and heat-treated for reuse in plastering the interior. In short, the courthouse was an almost perfect representation of itself when erected in Dearborn Village, and this is where the problem began. The courthouse was not just a courtroom. The single entrance on the first floor opened on a tavern where lawyers and clients could talk, buy a drink and food while waiting for the proceedings to begin. There was a narrow stairway to the second floor. The second floor included a room for use of the clerk and lawyers as well as the courtroom. In October 1961 my father and his second wife visited my wife, daughter and me in Detroit, and I took this photograph of the Postville Courthouse [at right]. When we entered the courthouse, we found the courtroom on the first floor and a doorway cut through the center of the rear wall. The docent (a college girl in her second or third year of college) approached us, and she explained the construction changes. The courthouse’s original layout was not meant for visiting crowds. Consequently, the first floor became the courtroom and clerk’s office, and the rear door became an egress for visitors. At this point she started to explain how the courthouse was disassembled, but Dad, to her surprise, interrupted to tell his role in the courthouse’s disassembly. Perhaps Ford’s alteration of the Postville courthouse should not surprise us. The May 25, 1916, Chicago Tribune quoted Henry Ford as saying, "History is more or less bunk." It is said that he was referring to history as traditionally taught by academics as being fairly useless. The Tribune further quoted Ford as saying, "We want to live in the present, and the only history that is worth a tinker’s damn is the history we make today." Notwithstanding Ford’s dim view of academic history, the docent at Greenfield Village was truthful about the alterations to the Postville Courthouse. As a postscript, Dad later told me the family that Ford moved to Detroit returned to Lincoln a few years later. They missed the rest of their extended family in Lincoln, and $5 a day was just not reason enough for continuing the separation. Frances (Charles's second wife); and Charles Stringer (October, 1961). In February 1932 Charles photographed the smoking ruins of the Oglesby Building (originally built by John D. Gillett in 1867-68) from the Bates Building, which stood directly across Broadway. 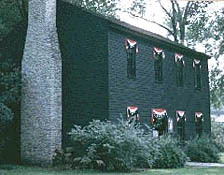 This building was owned by Will Bates, a cousin of William Maxwell. Leigh's note and a little digression (sorry, I cannot resist the Maxwell connections, but you will note above that Stan was the first to refer to Maxwell, and there is a Maxwell-Stringer connection, too, as you will soon see). William Maxwell explains that his Grandmother Maxwell made credit purchases at the A.C. Boyd Dry Good Store. She lived only a few blocks north of the store on Kickapoo Street, so could have easily walked to the store. 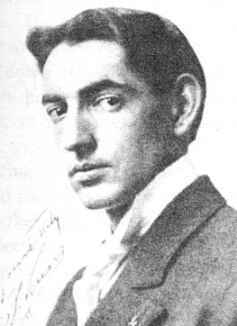 Maxwell writes: "My father, lying in bed upstairs, heard his father [Attorney William Creighton Maxwell] and mother quarreling over money. It was the barbaric custom for dry goods stores, and no doubt other stores as well, to bill their customers annually. Night after night, all through the month of January, my Grandfather Maxwell walked the floor with the shocking and interminable statement from A. C. Boyd in his hand. 'This item of five yards dress material,' he would begin, as if he had my grandmother on the witness stand. 'What kind of dress material?' My grandmother didn't remember what dress material she had charged on the twelfth of April of the year before. . . . Instead she burst into tears, and perhaps wished they were back in that little house behind the [Logan County] jail" (Ancestors: A Family History, pp. 144-145). The "little house behind the jail" was on Pekin Street, also a short walk to Boyd's, so perhaps being back in the little house would not really have solved the problem. Stan had emailed, "Dear Leigh: My brother is a Maxwell fan, and he tells me that when he read those pages from Ancestors he too wondered which house [had belonged to Maxwell's paternal grandparents]. I understand he checked the city directories, and the Lanier house had been previously occupied by the Maxwells. Attached is my earlier identification of the homes in my neighborhood. Leigh's note: The Logan County Jail's round chimney is at the right. Stan's message continues: "I mentioned the house at 914 Pekin had been the residence of Adam Bogardus. Chuck tells me that when Carl Koch went to remodel the living room he found lead shot buried in the ceiling. Apparently the good captain didn't confine his shooting to the firing range or backyard." The Welch home belonged to Ethel F. Welch, Langston Hughes's eighth-grade English teacher, later his correspondent and friend, and co-editor (with Raymond Dooley) of The Namesake Town: A Centennial History of Lincoln, Illinois (1953)--a main inspiration for this Web site. The passing of the Oglesby Building was vividly described in the February 23, 1932 Evening Courier. The headline screamed, "TWO DIE IN $200,000 FIRE – Jacob Van Deventer and Wife Perish as Flames Destroy Oglesby Bld’g – Three Others Escape in Lincoln’s Worst Blaze In a Half Century." 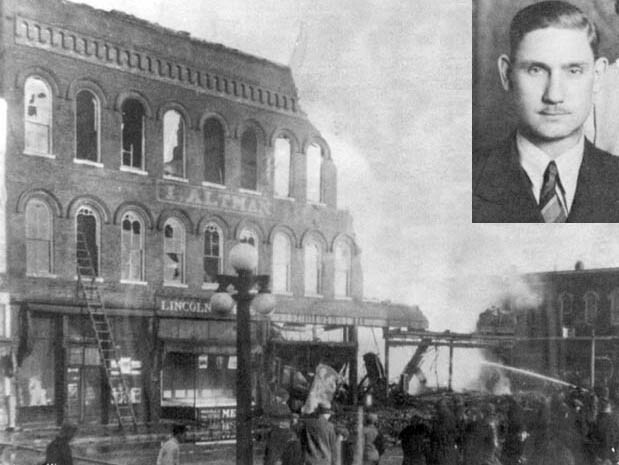 At 1:50 a. m. on February 23, 1932, policeman Peter Mode and night captain Otto Seitz discovered a fire raging in the Oglesby Building at the corner of Broadway and Kickapoo during their regular rounds. Less than an hour earlier they found nothing amiss. When discovered, the elevator shaft was consumed in flame, suggesting the fire may have emanated from the basement of the store. Firemen were engaged in raising a 55 foot ladder to the third floor apartment window facing Kickapoo Street where Jacob and Sophia Van Deventer were entrapped. Fireman George Hoblit attempted to rescue Mrs. Van Deventer, but, unfortunately, instead of waiting a few seconds for final securing of the ladder she attempted to jump to the ladder. She fell three stories to the pavement. She expired at 4:30 a. m. at St. Clara’s Hospital. Jacob Van Deventer disappeared from the 3rd floor window as the flames enclosed him. His body was found at 10:30 the following morning partially covered by debris on the 2nd floor when firemen searched the ruins. Apartment residents, Miss Frances Small, assistant postmaster, and Mrs. Laura Lamoreaux, escaped down fire ladders from a third floor window facing Broadway. Dr. B. C. Roberts was awakened in his bed, adjacent to the medical office, by the screams of the women. He fled the building with his records and an armful of clothing via the alley-way fire escape. For the women, this exit was cut off by flames. Lincoln’s Fire Chief, Thomas "Skinny" Watson, and five other firemen fought the fire with two lines from the town’s new pumper drawing water from the Broadway-Kickapoo hydrant. There were also two lines from the smaller pumper stationed on Pulaski Street. Other hoses were also brought to bear. Unfortunately, the flames were further fanned by a breeze from the north and the entire block was threatened. Help from the Springfield and Bloomington fire departments readily responded, arriving shortly after 2:30 a. m. Springfield’s Fire Chief Funderberg arrived with four men and a Stutz pumper from engine company No. 3. Knowing there would be sufficient equipment at hand with the Lincoln and Springfield pumpers, Bloomington Fire Chief Rolla Neal arrived with three additional fire fighters. 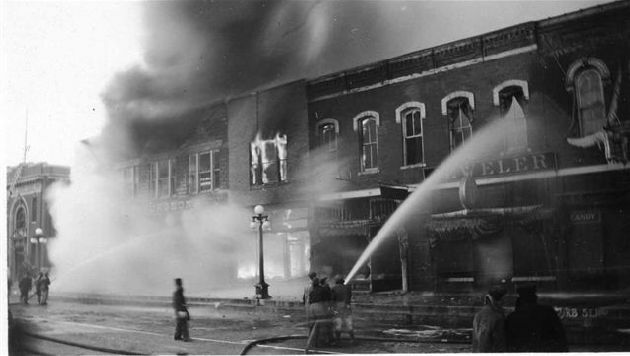 Spread of the fire to the south was limited by the firewall between Pfau’s Drug Store and the Oglesby Building, to the west by the alley between the fire and the Jacobs Building and the work of the firemen. Photo from Gleason, Lincoln: A Pictorial History, p. 180. George Hoblit photo from Paul J. Beaver, Logan County History, 1982, p. 337. Leigh's note: George Hoblit was the great uncle of Leigh Henson and the uncle of Jerry Gibson, both LCHS Class of 1960. 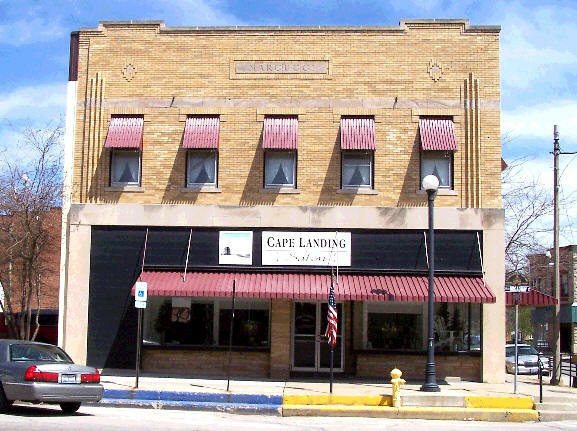 The February 23, 1932, Lincoln Evening Courier reported losses as Oglesby Building $100,000; S.S. Kresge Co. $35,000; Goldie Style Shop $10,000; and Dumser Grocery $8,000. Drs. C.E. Tilley, B. C. Roberts and I. H. Beckholt suffered a combined loss of $9,500 which included medical equipment. The insurance and realty office of Dean J. Harris lost $4,000 and his brother, attorney Homer B. Harris, lost $3,000. While the Lincoln Market did not suffer fire damage, losses attributed to water were placed at $3,000. The Illinois Dental Parlor loss was placed at $2,000. The loss of personal effects and clothing in Small-Lamoreaux and Van Deventer apartments were placed $1,500 each. Pearl Chowning’s beauty parlor lot furnishings and equipment loss was valued at $1,000. The George Armstrong barber shop loss was $400. Water damages to Pfau’s Drugstore and Dr. Katherine Cooper’s office above Pfau’s were both undetermined as of the 23rd. Records of the Central Illinois Electric and Gas Company showed that over a 10 hour period beginning at 11:45 p. m. 1,238,700 gallons of water were used. At times, the rate of water flow reached 1500 gallons per minute. The water in the new reservoir dropped by more than one half (an eight foot drop) during this period. As almost a footnote to this event, the Lincoln Market’s mouser, a Maltese cat, was found alive as it searched for a dry place in the market’s basement. 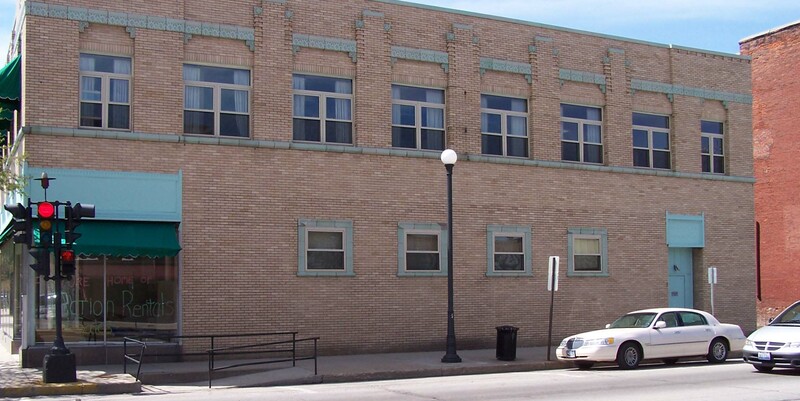 By afternoon of the 23rd, Meyer Griesheim, the owner of the Oglesby Building, announced plans would be developed to rebuild a two-story building on the site. It was stated that insurance covered 90% of the lost building’s value. 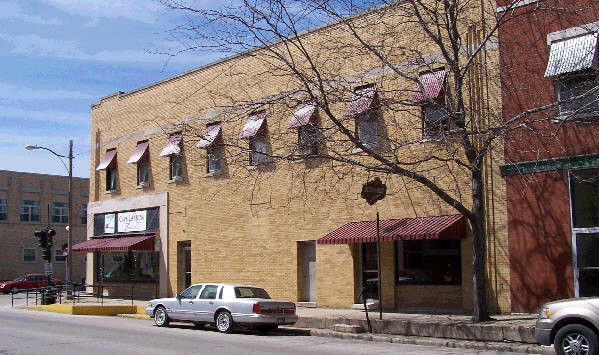 More information about the Gillett-Oglesby Building and the Griesheim Building that replaced it is given at http://www.geocities.com/findinglincolnillinois/sceneshistdist.html. This information includes an email from the current owner of the Griesheim Building, Bill Livingston, who lives in Newport Beach, CA. Mr. Livingston explained that his family was renovating the Griesheim Building in 2004, and he planned to return to Lincoln after a 40-year absence to see the renovations when completed. Photo from Beaver, History of Logan County, 1982, Table of Contents page. In the following month, the Bates Building burned, and Charles Stringer lost all of his equipment and supplies. In searching the ruins of the Bates Building, Charles found the lens to his portrait camera. The lens survived the fire with only a minor chip at the edge of the lens. With this lens, a new camera was built, and he reassembled his business after his friend Gus Marcucci rebuilt on the site. Note: Gus Marcucci was an Italian immigrant who became a well-known businessman in Lincoln, Illinois. 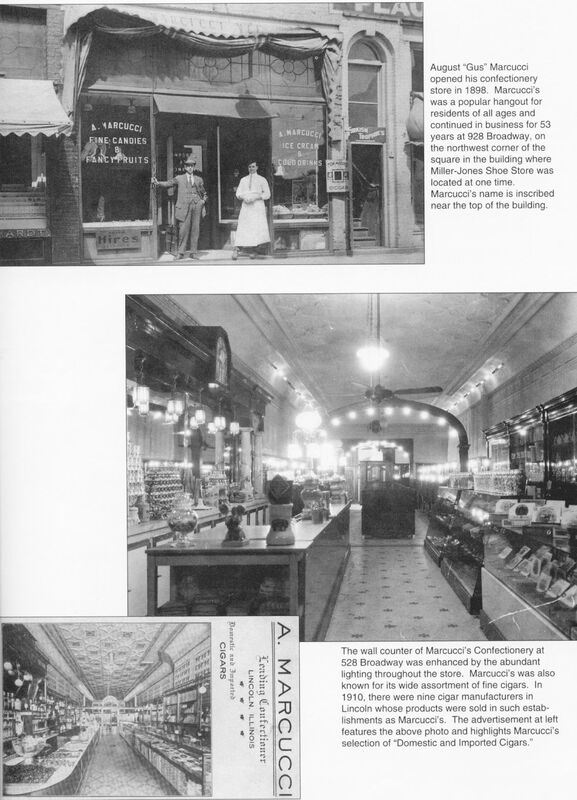 Access this link to large, detailed photos of the exterior and interior of Marcucci's Confectionery (Gleason, Lincoln: A Pictorial History, p. 97). For the Courier's Gus Marcucci story, scroll down this page to the link beneath the photo captioned The New Marcucci Building in 1935. True to his word, Meyer Griesheim with his son-in-law, Henry Edelmuth, rebuilt on the site of the former Oglesby Building during 1932 and 1933. The Kresge Co. returned as principal occupant, and the southwest corner of Broadway and Kickapoo continued to be known as the "Kresge corner." The building, in the Art Deco architectural style, popular in the 1920’s and 1930’s, was designed by Architect John Deal. Leigh's note: Stan gave me the idea of looking for information about John Deal. John (J.M.) Deal was also the architect who designed the yellow-brick Lincoln High School in 1900 (where William Maxwell spent his freshman year) (Stringer, p. 428); the present-day Logan County Courthouse in 1902 (Stringer, p. 239); and the two-story, red-brick Administration Building of Lincoln College in 1902, which burned January, 1969 (Beaver, History of Logan County 1982, p. 86). Less than three weeks following the fatal blaze on February 23rd. Headlines of the Lincoln Evening Courier cried, "CITY HAS $250,000 FIRE – Seven Stores Wiped Out as Flames Sweep Half Block in Downtown." "…[F]lames destroyed or gutted a half block of business buildings on Broadway…" across from the burned out Oglesby Building. Losses were estimated at $250,000 to $275,000. The fire apparently began at 2:00 a.m. 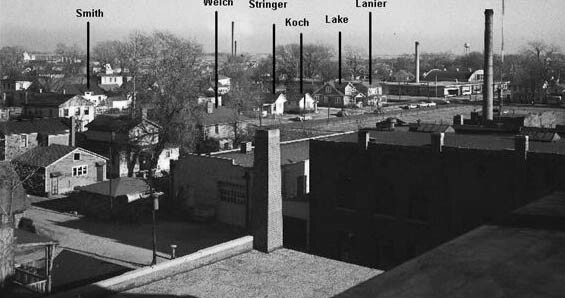 Consumed in the conflagration were the Marcucci, Bates, and Landauer Buildings which stood between Kickapoo Street and the alley. The alley prevented the fire’s spread to the Lincoln State Bank. A fire wall prevented flames from reaching the J. C. Penney Building and the new Knights of Columbus Building to the north. Note: for better photos--discovered after the initial publication of this Web page--, scroll farther down this page. The Marcucci, Bates, and Landauer Buildings were respectively valued at 40,000, 40,000 and 60,000 dollars. Business affected by the fire included Spurgeon’s, $40,000; House and Sons jewelers, $20,000; Miller and Jones, $15,000; Quality Shop, $12,000 and Weymer Paint Store $7,000. The office tenants were collectively estimated to have lost $25,000. The Weyman Paint Store was new and recently stocked with paint and combustibles prior to its opening. The office tenants burned out in the fire included Dr. V. C. Rimerman, dentist; Dr. C. C. Ogle, dentist; Unique Beauty Shop; M. Vehon Grain Co.; William S. Ellis, attorney; C. Everett Smith, attorney; Dr. Jens Lund, masseur; Grover C. Kiest, insurance; Stringer’s Studio; C. O. Williamson office; W. C. Bates office; Ben Warrick, music studio; Darby dance studio. In addition, $25,000 stock and fixtures in the Marcucci confectionary sustained undetermined damage as did Harnett clothing store, and law offices for Miller and Miller and Homer B. Harris. At 1:45 a. m. smoke was encountered in the Quality Shop and the House and Sons and A. Marcucci establishments by the police during night rounds. Smoke prevented responding firemen from entering several rooms and specifically locating the blaze. However, floor heat in the stores indicated the fire was under House jewelry and the Quality Shop. Two hose lines were laid and water played into the basements to flood the flames. There was no basement under the Weymer floor and a firewall stood between the Bates and Landauer Buildings. Northwest winds carried embers as far as the I.O.O.F home on Wyatt Avenue. Lookouts posted on the courthouse and other buildings watched for secondary fires. About 4:30 a. m. flames suddenly burst the skylight above the Unique Beauty Shop, and in minutes the rear of the Spurgeon store was aflame. How the flames temporarily skipped the Weymer paint store was unclear. The law office of Dean J. Harris was burned out for the second time in three weeks, although fixtures were successfully removed. The offices of Miller and Miller were protected by a fire wall although flames reached their doorway. The J. C. Penney store was undamaged by fire, water or smoke. Interestingly, the fire department allowed owners and tenants to enter the buildings during the fire to retrieve merchandise and other valuables. These were carried to nearby buildings. Before daylight, the apparently threatened and recently remodeled and decorated Knights of Columbus building was stripped of its furniture by its members. A few years ago my cousin Loren Stringer told me that during the night of this fire, he and his brother Richard were awakened by their father, Harry Stringer. Their father asked if the boys wished to go downtown to see a fire. Both teenagers readily agreed. When they arrived, the fire was raging in the lower floors of the Bates Building. A stiff northwest wind now rapidly spread the flames. 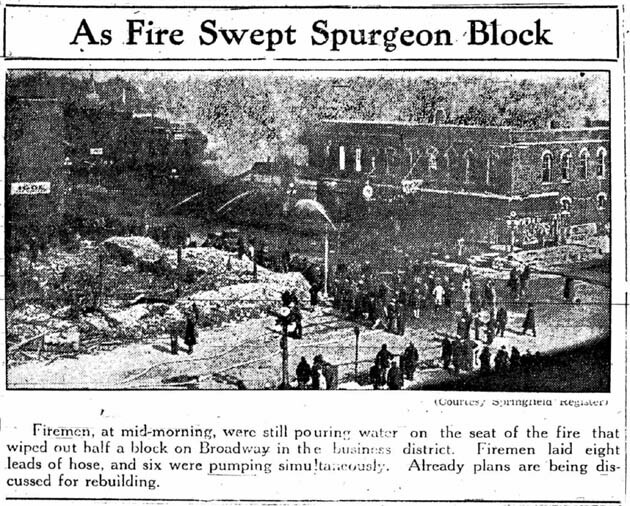 Three hose lines were now pouring water into the House and Quality Shop basements, while two more hoses played water onto the fire from the Penney Building and a sixth line from the alley kept the Spurgeon store under control. Dr. Lund spoke with Loren and Richard and asked them if they would help him retrieve some expensive new towels he had recently purchased for his business. Both boys agreed to accompany him to his premises. While Richard and Dr. Lund succeeded in throwing down some towels from the second floor, Loren told the writer that smoke was just too much for him and he quickly exited. Aid from Bloomington and Springfield fire departments was requested at 5:00 a.m., and both arrived within an hour. The Springfield fire fighters laid a hose to the top of the Lincoln State Bank building effectively preventing further spread of the fire. Unreported by the Courier was the debate on fire fighting at the Weymer paint store. A hose had been laid to the Weymer site. The debate was whether to break an entry for pouring water into the shop or leave the front intact. Loren told the writer that in the course of the discussion he found a brick and held it until the decision was reached. After it was decided to force an entry for the hose, the brick was thrown and a window shattered. Following the breach there was a sudden blast of fumes and fire shooting out onto Broadway culminating in a mushroom cloud. The flammables at Weymer’s and the film in the Stringer Studio significantly contributed to the fire’s intensity. Fire fighters kept the blaze from the first floor of the Marcucci Building and the Marcucci ice cream factory at the rear of the Spurgeon store. 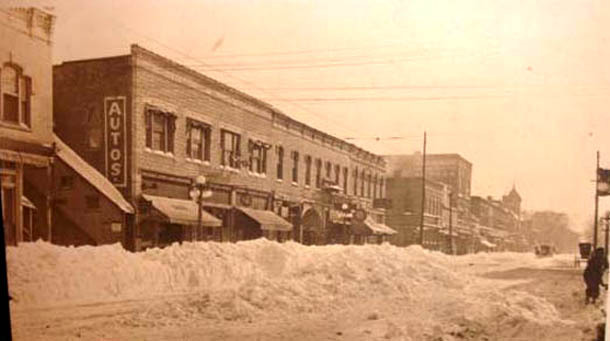 At 8:00 a. m. the first walls fell, and shortly afterward the alley wall of the Miller and Jones Building struck the Lincoln State Bank Building and broke several windows. Other potentially dangerous walls were taken down. By 9:30 a. m. firemen were picking up extra hose while several lines continued to wet down the debris. Many of the firemen and volunteers had worked for eight hours without relief under adverse conditions. Afterward, it was found that two large safes in the House and Sons Jewelers had fallen to the basement. Many of the second floor tenants failed to recover anything. During the night onlookers from town and the county had gathered to see the fire. Motorists on east route 121 reported flames were visible in Warrensburg, and smoke and fire were visible from other towns in the county. Later my father, Charles Stringer, found the brass lens casing to his portrait camera in the rubble. The lens itself was undamaged except for a small chip at the edge of the lens. This did not adversely affect the optical properties of the lens. This lens was used in a later camera with which he rebuilt his business in the new Marcucci Building. As I grew up, reference to "before the fire," "in the fire" or "after the fire" punctuated time references and things that were lost in "the fire." For Dad it was a salient event as was WW I. For me it became a mile post that placed family events that I did not know about or could not remember. Among the unrecorded losses from the fire was Dr. Lund’s sailboat, which he was constructing in one of the rooms to his office, and my father’s collection of aerial photographs taken by his squadron which he had printed in World War I. The aerial photographs showed the German trenches from Verdun to St. Mihiel Salient in France. Today it would be appreciated by military historians. Note: In July, 2006, Stan emailed to say that his daughter had discovered the photos below showing the downtown Lincoln fire of March 14, 1932, on Broadway Street. The photos were taken by Stan's father, Charles Stringer, as his studio was being destroyed by the fire. I chatted with my brother about the two photos from the March 14, 1932 fire. Both pictures were printed as typical snap shots as commonly taken with a box camera. Since Dad’s professional cameras were consumed in the fire, I’m certain these were taken with our family Kodak box camera. Smoke was first reported at 1:45 a.m. and as the Courier reported, “at 8 a.m. the first wall fell and a short time later the alley wall of the Miller-Jones store crashed toward the bank building across the alley breaking several windows.” Since the box camera required daylight for use and the alley wall and bank windows appear intact, I guess the pictures were probably taken shortly before 8:00 a.m. The first snapshot [Landauer Building] shows the ladder to the top of the Lincoln State Bank. The Courier reported that the Bloomington fire department laid a line to the roof of the bank prevent the further spread of the fire. 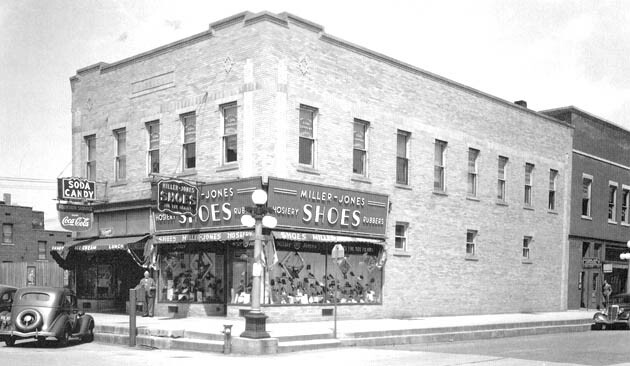 If you look closely, the Miller and Jones street sign hangs a kilter, and with enlargement the word “SHOE” can be made out. Looking at the second floor and moving to the left is the Bates Building with five windows facing the street. At street level one can read the most of the word JEWELER. This was the House and Son store. Please note the pocket watch street sign, typical of the time, but it's quaint Americana now. The two windows above the jeweler and next window to the left was Stringer’s Studio, my Dad’s shop. Next to House and Son is The Quality Shop. As near as I can determine, this was a combination stationary and party goods store. The final two windows of the second floor of the Bates Building were not occupied. Next we see the blazing entrance and second floor of the Weyman Paint Store. To the left the final building is the Landauer Building which included Spurgeon Mercantile Company and Miller and Jones shoe store. The second floor windows show lettering, but it is too obscure to be read. One of the things that amazes me now is how well a box camera captured the scene. Still I'd rather use my digital camera. [Stan's previous text continues]: Of the building owners only August (Gus) Marcucci rebuilt. The yellow brick building now long familiar to Lincolnites, was the only building immediately constructed in the half block facing Broadway at Kickapoo Street. For years a seven foot board fence faced Broadway to the alley. The burned out properties were not filled in, and this made it look like part of a bombed out city. As a child, I was admonished not to stray into that area. I complied with this, until one Saturday afternoon some friends wanted to check it out. I went with our little group. There really wasn’t anything of interest there, but before we left one of Lincoln's finest found us. He asked us our names which we gave. I don’t know about the other guys, but that evening Dad asked me if I’d been in that ruin. I confessed, and I was again admonished. What puzzled me was how Dad knew. It just never occurred to me that the officer had told Dad. The streetcar tracks in the foreground left and the cupola of City Hall in the background at right clearly identify this remarkable and rare snow-storm scene on Broadway Street in Lincoln, Illinois. The buildings in the foreground were destroyed by the 1932 fire described above. "The picture well predates March 14, 1932 fire. I've turned back to the two pictures I used in my story of the fire for comparison. The bank building that stood across the alley on March 14, 1932 has yet to be built. The Landauer building east of the alley is standing, but I don't see the Miller and Jones sign that hung over the sidewalk. The other buildings in the half block are the same. The globe street lights at the alley and in mid block are both there, as is the round pocket watch sign that stood over the sidewalk at House and Sons Jewelers. Other items of note are the telephone wires running across Broadway and down the above alley, what appears to be a horse and cart in the distance coming toward the camera, and the buggy parked on the extreme right of the picture. Incidentally, when I was a child and before the war, the Post Office was still delivering some mail to the country via horse and buggy. I can attest to this, because a buggy with U.S. Mail on its side panel would routinely come up Pekin Street past my house on its return to the Post Office." 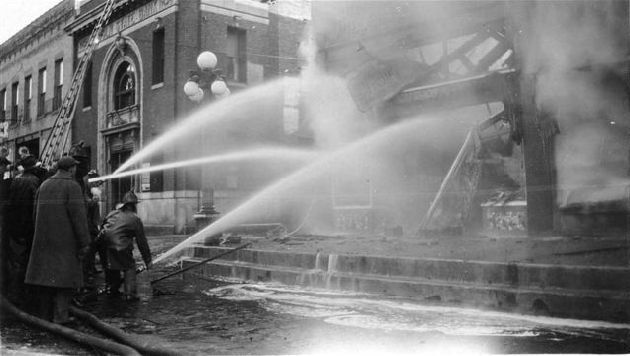 The fires that destroyed the various downtown Lincoln historic buildings in 1932 was neither the first nor the last major fires Lincoln suffered. Judge L. B. Stringer’s Logan County History (1911) recounted the earlier series of fires during the 1870’s in the town’s business district. Before 1870, the only fire of significance had been the burning of the court house. Ten different fires occurred between April 1870 and April 1878. On May 13, 1871 the Hungerford & Beach planing mill with its machinery and stock burned. Also consumed in this fire were the Haines lumber yard, Eager’s paint shop, two brick homes and five barns. Reported losses were $15,000 for Hungerford & Beach, $6,000 for J. P. Haines, and S. T. Atkins $1,500. The other losses were not stated. Near midnight on December 6, 1871, a fire was found in the rear of Pegram & Sons Warehouse. This spread and in an hour all of the buildings on the northwest half block of ten Broadway were destroyed. On March 8, 1872, four store buildings in the Brewer block were burned at a cost of $25,000. In August 1871, The Lincoln Woolen Mills burned. The loss was $30,000. One night in March 1873, a disastrous fire originated in the building occupied by the Hart & Eves bakery. All of the buildings on the north side of Pulaski Street from the alley and around the corner on Kickapoo Street to the Latham Building opposite the courthouse entrance on Kickapoo. Sixteen firms were burned out at an estimated loss of $30,000. On June 4, 1874 a fire at Keil’s Building on Chicago Street destroyed buildings on the north side of Pulaski Street to the alley. This with the March 1873 fire completed the destruction of the north side of Pulaski between Chicago and Kickapoo Streets. The estimated loss was $15,000. On July 14, 1874, a fire originated in A. S. Gutherie livery stable on Broadway facing the courthouse. This burned west to Kickapoo Street and then north to the alley. Losses were placed at $10,000. On March 4, 1875 the Gessner Building on Chicago Street burned. In 1877 Lowery & Johnson’s machine shop was burned. The loss was $5,000. In 1878 the Peter Mueller & Son brewery was destroyed. Judge L. B. Stringer’s history concluded: "Despite this series of fires which had destroyed over one-half of the best business portion of the town, improvements were soon noticeable on every hand and new buildings were before long erected on the burned sites, the new buildings being more modern and substantial and all being constructed of brick and stone." 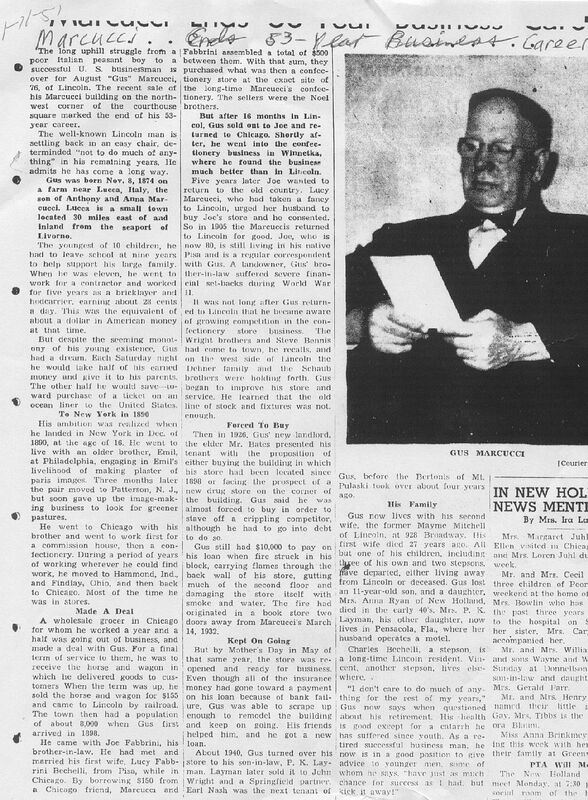 In 1939 Charles hired a young assistant named Mark Holland. Mark had an interest in photography and flying. Before the war Mark and Glen Courtwright would take aerial photographs of farms and local points of interest. Originally published in LincolnDailyNews.com, 7-10-01. 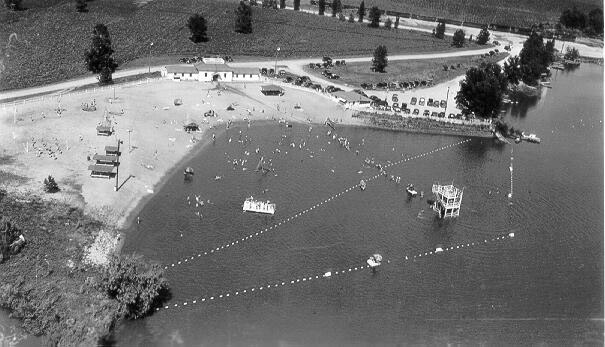 The accompanying picture of the Lincoln Lakes beach was taken by Mark Holland shortly before World War II. At this time Mark and Glenn Courtwright were photographing local scenes and farms from the air and hoping to develop a local interest in their pictures. The war intervened, and Mark entered the Army Air Corps. Several extra prints were made, and my father, Charles M. Stringer, saved this one. The picture was probably taken in June, as the lakes are flooded from spring rains. The flooding isn’t obvious at first, but if one looks closely, the wooden dock, which ran from the shore to the diving platforms, is under water. A line of swimmers are standing or walking along the dock. From June through August the water line receded, so that the walk over the hot sand from the bathhouse to the water’s edge seemed unending and unendurable. For youngsters, a Saturday at the beach and swimming lessons in the morning during the week were always great fun. As I recall, entry cost a quarter, you were given a numbered basket and pin, and you went to a changing stall. Girls and women went to one side and boys and men to the other. Clothes and shoes went into the basket, and the basket was turned in for holding. You fixed the numbered pin to your trunks and later reclaimed your clothes with it. For many of us, swimming season lasted only until the end of July. In August the radio and the newspapers began reporting the number of new poliomyelitis cases. For many moms this was enough to forbid further swimming. We thought this totally unfair. It may seem odd nowadays, and while the press never photographed President Roosevelt in a wheelchair, the public knew he suffered the effects of polio, and the onset of his illness came after a swimming excursion. The polio scourge is rarely thought of now, but until the advent of massive polio inoculations the annual incidence of the paralytic disease was 11.4 cases per 100,000 people. When polio inoculations became prevalent, the incidence declined to 0.5 cases per 100,000, and with the oral vaccine the present rate is 0.002 to 0.005 cases per 100,000. Notwithstanding the general maternal fear of polio then, I never personally knew anyone in grade school, or later in high school, afflicted with the disease. I might have continued with a childlike naiveté about the disease, except for one Saturday in the fall shortly after the war. I was then in junior high school. On that day in the storefront of what is now Sew Many Friends, an iron lung was on display. The iron lung wasn’t empty. It was operating, and it held a girl a bit younger than myself, afflicted with polio. While the presentation was said to be for educational purposes, a freewill offering was requested. Clearly the disease was not only physically but also economically devastating, particularly in an era when health insurance was almost unheard of. In passing, one thought how unsettling it must be for the girl to be simultaneously subject to scrutiny and sympathy. 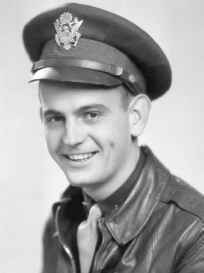 After WW II began Mark enlisted in the Army Air Corps and entered flight school. Before leaving, Mark told Charles that if the opportunity presented itself he would buzz Lincoln, and the night before he would telegram Charles to alert him. While Mark and others in his flight class would have liked to fly combat craft, his class was assigned to troop carrier command. 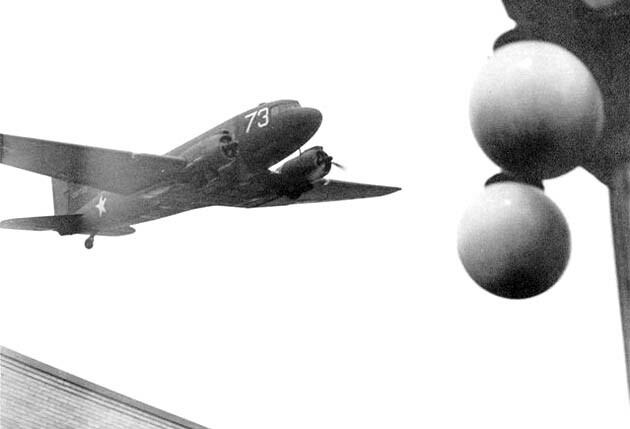 On March 23rd, 1943 Mark buzzed Lincoln, and Charles took photographs of Mark’s Douglas Skytrain C-47 plane. Charles’s photographs later appeared in Paul Gleason’s Lincoln: a Pictorial History. A year ago I received a copy of Paul Gleason’s Lincoln: A Pictorial History, and I found the pictures of Mark Holland’s buzzing of Lincoln. Regrettably, the author did not make attribution to the photographer for these or any other photographs, and perhaps this was not possible, as so many dated back so far. In any case, I thought your readers might enjoy a story behind these pictures. My father, Charles M. Stringer, had a photography studio on the second floor of the Marcucci Building in the ’30s and ’40s. During Mark’s later high school years he worked for my father and at the same time developed an interest in flying. After our entry into World War II, Mark entered the Army Air Corps and flight school. At some point Mark told dad that if the opportunity ever came that he could "buzz" Lincoln, he would telegram dad the night before. Dad agreed he’d have his Speed Grafix loaded and snap the pictures. As you can guess, Lincoln was not the only town being buzzed. There was a general order prohibiting this, but there was little the military could really do. 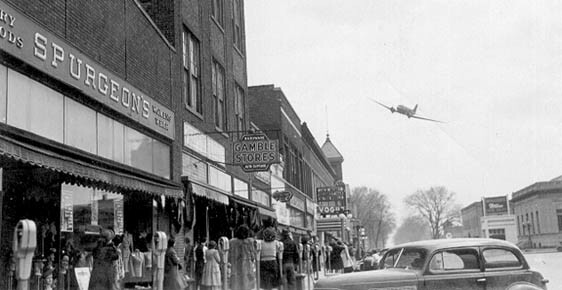 Pilots were needed overseas, and buzzing your hometown would not ground a qualified pilot. One night the telegram came, something about seeing Lincoln soon. Dad knew it meant Mark would buzz the town the next day. My dad told me to keep all of this to myself, and I was certain I was in on a big military secret. At the time, I was in the fourth grade at Monroe Elementary School. My teacher was Miss Hazel Holland, and our classroom was on the second floor. Miss Holland was a cousin of Mark’s. Needless to say, when Mark made his first run, the class was out of hand. We ran to the windows for a grand view of the action. After Mark finished his runs and the class had quieted down, Miss Holland asked if anyone knew who was flying that airplane. While I had to fake it, we all had blank faces. I’m not sure if she suspected it was Mark, but nothing more was said. Dad got the pictures, and these were kept out of circulation until Mark returned. During the war each kid had his personal hometown heroes, and Mark was one of mine. The party was a welcome home party for Mark Holland shortly after he returned from Europe. When Mark returned, like other veterans, he brought some souvenirs home. Included in this was the blouse, metals and hat of an Italian Fascist party member. 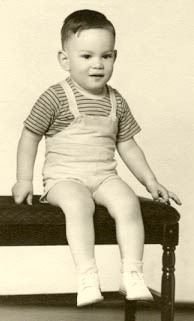 My dad got a kick out of this, and as I recall Mark had Dad dress up in the outfit and several portraits were taken with Dad mimicking Mussolini. As far as I know, those photos are lost, but the night of the party dad donned the outfit again for the benefit of Mark's friends. On the left, next to the pseudo El Duce is Mark's father. Unfortunately, I can't identify anyone else in the photo, and if you're asking where's Mark. He's taking the picture. 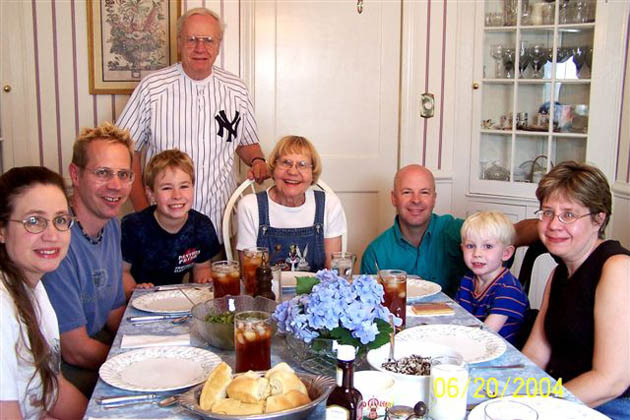 While I hadn't seen the picture for years, I received it via e-mail from Mark's youngest son, Steve Holland. Steve had seen the article I wrote for the LincolnDailyNews.com about Mark buzzing Lincoln. We exchanged emails for a while about Mark and my father's friendship and a war experience Mark told dad when he visited us on his return. The pictures appearing in Paul Gleason's book, Lincoln: a Pictorial History, were given to him by Marcella, Mark's wife. I learned this spring that Marcella died this past May of cancer. Steve Holland assured me that Marcella had read and enjoyed my story about Mark buzzing Lincoln. 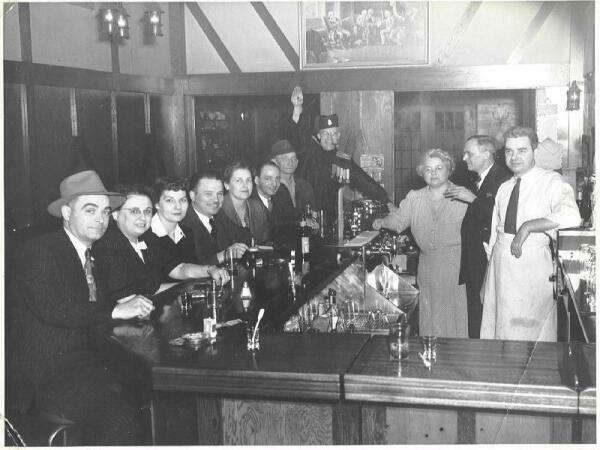 With Stan Stringer's permission, I emailed the above photo of the Hotel Lincoln bar scene to 160 mid-20th Century alums of Lincoln Community High School. For another posting of the photo and the resulting discussion of possible identities, see http://findinglincolnillinois.com/wateringholes.html. Leigh's note: When Stan mentioned that his father had worked for Venard, I recalled seeing information about Venard in Lawrence Stringer's 1911 History of Logan County. Perhaps it will be of interest to some. This page thus offers information about and/or the work of four generations of Lincoln photographers: professionals Venard and Charles Stringer, and talented hobbyists Mark Holland and Stan Stringer. C.L. Venard needs no introduction to those who are familiar with what is being done in Illinois in the field of photography today, for he has made a record which places him in the foremost rank among the representatives of the art in this state. He has loved photography and followed it since the age of thirteen years, when he began to acquaint himself with the business. He worked at various places in the west and afterward in St. Louis and later went to Peoria, Illinois, where he remained in a studio for five years. He then came to Lincoln and has made for himself a splendid reputation by the artistic work which he has done here. In this connection the Chicago Tribune said: "No longer may the proprietor of the large city 'studio' assume artistic superiority over the small town 'tintype' man. The reason is that the 'tintype' mechanic has largely followed the daguerreotype operator into the wilderness of history. In the smaller places the professional photographer has brought his work up to the grade of the city manipulator of lenses, and at times even outreaches the latter in quality of pictorial product. "In years gone by the village photographer was an 'institution' venerable and antiquated. In front of his quaint gallery always stood a cabinet of family photographs, from grandfather to baby. All of the portraits depicted the subject leaning against the familiar balustrade and shadowed by one neat canvas landscape. The women were with hands folded, the men with one thumb drawing the coat slightly apart, displaying a genteel hint of a watch chain. The 'wooden' aspect of those old-time village photographs, entombed and cherished in thousands of family albums, has been a shining mark for the cartoonist. Strangely, the small town photographer rarely thought it worth his while to pursue the natural beauties of the country-side so near at hand. He was steadfast to this little 'gallery' of blue walls, daubed scenery and glass roof. "These days the 'down state' photographer has a broad a view of the possibilities of his profession as the city artist. He is advancing swiftly year by year, as these annual photographic exhibitions simply demonstrate. "At the last meeting of the Association of Illinois Photographers the gold medals in two classes were awarded to C. L. Venard of Lincoln. These were class A, the dark background collection and class B, the light background collection. Mr. Venard, it is declared, has developed likenesses to a point which photographers all over the land are trying to reach, samples of his work showing that the best results are not necessarily found in the metropolitan studio. "The winner from Lincoln is twenty-five years old and has been in business for himself only one year. He never before exhibited any pictures for prizes. "The Association of Illinois Photographers was instituted for the purpose of advancing the profession in general. The members get together once a year to present samples of their best work. Expert judges pass on the exhibits and announce the awards. "It was declared by the judges that Venard possessed above all the others the facility for bringing out the individuality in his pictures even in the most difficult phases of portraiture. Even of more interest to the mechanical and professional eye was the fact that his products were not printed upon carbon paper but on one of the substitutes for it. This was accomplished to deceive the most critical eye." Moreover Mr. Venard won more prizes in 1909 than any other Illinois photographer, receiving the gold medal in classes A and B, the two highest classes in which Illinois photographers were awarded prizes at the convention of the Photographers' Association of this state. He was awarded the certificate of honor, with a rating of 98, by the Wisconsin Photographers' Association, in the grand portrait class, open to the world. He also received the award of the '"certificate of special distinction" at the convention of the Indiana Photographers' Association, this class being open to the world, the award being one of the highest honors attainable in the United States. His exhibit in the grand portrait class, open to the world, in Minnesota, was given second rank. He has studied every phase of the business, with which he is acquainted in its most scientific and artistic as well as mechanical phases, and his productions are far removed from that class of work which is simply the transference of a likeness to paper. He studies the individual, selects a natural pose and moreover possess the ability, as few photographers do, of brining out the character of the individual in the photograph (Lawrence Stringer, History of Logan County (1911), pp. 236-240). Leigh's note: A curious sequel to the Venard-Stringer connection was the occurrence of a Venard-Stringer-Henson connection. Early in 2006 I received an email from Bill Venard, grandson of C.L. Venard. Bill wrote me thinking that Stan had published this page, since Stan provided most of the content (I have merely arranged it and published this Web page). I emailed Bill Venard to explain this situation. When Bill responded to me, we realized that Bill had been one of my students when I taught at Pekin High School. After Stan learned of our communication, he emailed Bill. Below is Stan's email to Bill, followed by Bill's original message to me. The point of all of this is that the digital Web enhances the Web of life. I was delighted to see your e-mail today. 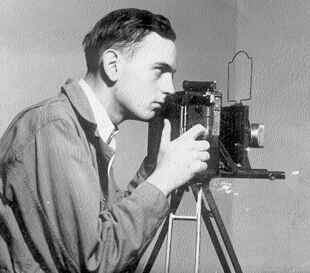 The photographer (Charles M. Stringer) in my story was my father. My grandfather was Henry Stringer. It is absolutely amazing the contacts I have had through this web page, and my stories first published by www.LincolnDailyNews.com. 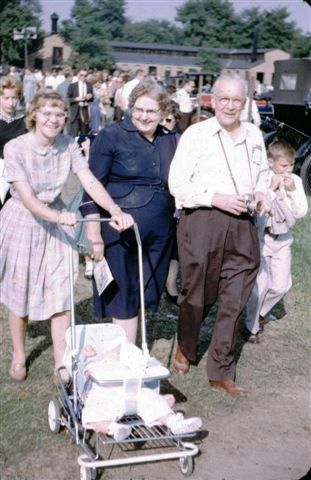 I was a late baby in the family my older brother reminded me of Dad's connection to C. L. Venard and Felix Schantz in Fort Wayne. As a kid I remember Dad mentioning CLV, but when I started to write about Dad my brother filled in the names of the photographers Dad had worked for. The bio about CLV came from the county history written by Lawerance Stringer (no relation to us). Dad had some picky customers too. Chuck, my brother, told me of one woman who was ordering Christmas postcards of her house. Her house was a Spanish style with a pink exterior. This was in the thirties, and as you know color photography was essentially non-existent. She kept after Dad for assurance that house would be printed pink; she was not asking for hand colored postcards. Dad kept assuring her he knew what she meant. Well, just as he promised, when she picked up the postcards she was delighted to see they were exactly as promised. Apparently, Dad had learned some photochemistry that was not commonly practiced, and it fit the bill. I've pretty well told the story of my grandparents and my Dad on the webpage. 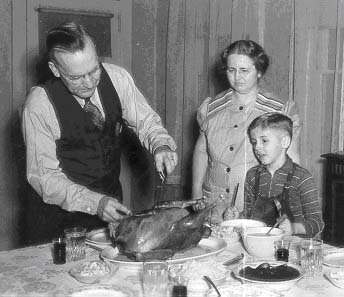 Attached is a picture I used as a Thanksgiving greeting this past year. Dad's carving, and Mom and I are watching. My brother took the picture at Christmas 1942. If it's possible, could you please scan the Tribune article and e-mail it to me. I would appreciate seeing it. I trust you won't mind if I share your letter and my reply with Leigh Henson, whose website includes the Stringer page, and my brother Chuck. I was recently doing a search through Google and came across your website. I noticed that your grandfather (? ), Charles Stringer, apprenticed for a photographer named C.L. Venard in Lincoln, Illinois, early in the 20th century. Charles L. Venard, known as "Van" to his friends, was my grandfather. He often spoke fondly of his days in Lincoln. I have some old glass negatives (8 X 10) of some of the women that he photographed. I have the article for the awards he won for his portraits. He gained some notoriety for them as far away as Chicago. The Tribune published some of his photographs and ran an lengthy article on him back then. Apparently he gained some clients from the Chicago area who actually drove all the way to Lincoln to be photographed. That's not too hard to imagine today, but that was a pretty long journey back then, especially since most of the roads were still dirt. He gave up his studio in Lincoln because, as he put it, "the women were just too picky and they drove me nuts." He moved to Peoria where he began producing commercial motion pictures; one of the first in the midwest. His clients included Keystone Steel and Wire, Caterpillar Tractor, and Future Farmers of America. During that time he made friends with one of the Byerly brothers in Peoria. The built an air strip and bought a biplane together and they were the first to do aerial photography of Peoria and much of the neighboring area. Charles Lindberg used to land at that strip on his mail flights from St. Louis to Chicago, so he and Van got to know each other. He finally 'retired' when he was about 85 years old. Around that same time he sold his business and moved to Ft. Myers, Florida, where he lived with my step-grandmother until he died in 1981. I think he was 96. He was a great guy. My father was also a photographer, as am I, although I took about a 20 year break to go into ministry. When I read your website and saw my grandfather's name, I just had to write. What a small world the internet has made us. This advertisement appeared in the March 3, 1907, Lincoln Courier. It mentions Sousa, and barely mentions the Sousa band, and that’s how America thought. The march was the queen of music and John Philip Sousa was king of the march for the average everyday American. The man with the Pince-Nez spectacle frames and beard was the icon of martial music. Tickets were 25¢, 50¢, 75¢ and one dollar for this matinee performance. In 1901 and 1902, the John Philip Sousa ensemble had toured Europe and returned each time with glowing accolades. Among these, London’s Pall Mall Gazette was quoted, "[Sousa] never grows stale!" From 1892 to 1931, the Sousa band performed 15,498 times, and one of these was a matinee on March 8, 1907, at the Lincoln’s Broadway Theatre. Again, on March 6 an ad in the Courier quoted the January 11, 1906, Boston American, "Sousa is great! …guilty in the first degree of giving the finest performance of his career." This ad was followed by a program listing, which included Elizabeth Schiller, soprano; Jeanetter (sic) Powers, violinist; and Herbert Clarke, cornetist. On March 9, the Courier review of the performance begins with "WARM WELCOME FOR GREAT SOUSA – Twelve Hundred People Attend the Grand Concert Given in Lincoln – FINE COMPANY OF SOLOISTS – Modest and Unassuming Demeanor of the Great Director and Master Immediately Won the Friendship of a Distinctive Audience." It’s not surprising that Lincoln warmed to Sousa, for he uniformly affected similar receptions during foreign and national tours. However, this ensemble included a local interest, Miss Grace Jenkins, a Lincoln girl and violinist. While the reporter identified her as a soloist, she did not solo during this appearance. When interviewed, Miss Jenkins referred to the director in kind and friendly terms. The theatre was filled to capacity with twelve hundred people, and receipts exceeded $600. The program: The William Tell Overture; Herbert Clarke’s cornet solo – Bride of the Waves; Looking Upward, a Sousa suite (By the Light of the Polar Star, Under the Southern Cross and Mars and Venus); Elizabeth Schiller’s soprano solo – Card Song from Sousa’s operetta Bride Elect; Sousa’s Songs of Grace and Songs of Glory. Ziehrer’s waltz, Vienna Darlings; Ganne’s Air de Ballet, The Gypsy; Sousa’s march, The Diplomat; Miss Jeanette Powers’ violin solo, Caprice Slave by Gelose; and concluded with Wagner’s Ride of the Valkries. The program was supplemented by encores after each announced piece, and once offering two encores after one selection. Encores were not repeats of the announced piece but different classical and popular tunes. The Courier states, "These [encores] included a paraphrase of Everybody Works But Father, the Sextet from Lucia and a number of others showing the versatility of the director even in the matter of responding to encores." The Courier continues, "The bandmaster has touched the heart of the public by his masterly style of catering to the taste of the public, realizing that in so doing he does not lower the standard of his band. The closing number, the only Wagner number on the program was a magnificent specimen for the work of the organization and formed a fitting climax to the day." Indeed, the program Sousa presented in Lincoln was quite sophisticated, and apparently the townsmen responded in kind, as there is no mention of repeated requests for popular and overplayed marches as sometimes plagued Sousa’s foreign performances. A notable quotation from Sousa helps to explain why his public found him so endearing, "If, out of the cadences of Time, I have evoked one note that, clear and true, vibrates gratefully on the heartstrings of my public-I am well content." The Courier noted that Sousa and his ensemble had previously performed in Lincoln, and my brother Charles Stringer tells me, Sousa performed at least once more in the 1920’s. Sousa died at the Abraham Lincoln Hotel in Reading, PA on March 6, 1932. Afterward, it was determined that he had suffered a heart attack. Sousa had been invited to Reading to appear as guest conductor with the Ringgold Band. The previous night he complained of a cold as the band rehearsed. Nevertheless, he continued, and closed the rehearsal leading his march, The Stars and Stripes Forever. Sousa is buried in Congressional Cemetery in Washington, DC. President Ronald Reagan on December 11, 1987, signed a law naming The Stars and Stripes Forever as our national march. The only other song officially recognized by law as a national song is The Star Spangled Banner. The Broadway Theatre – Picture from the archives of Main Street Lincoln. Regrettably, Lincoln’s Broadway Theatre, later called the Grand, is now gone. The theatre burned in mid February 1960. It was built by George H. Johnson of St. Louis in 1895 at a cost of $20,000. During its lifetime it presented vaudeville, plays, and concerts. With the death of vaudeville, the bill of fair turned to movies. The Grand had been closed for several years before the fire. The fire was thought to have been caused by youths or vagrants who had been in the empty building. The theatre stood at 311 Broadway; present site of Gossett Cleaners. July, 2005. Respond to Stan at sstringer@cox.net. Link to Sousa's Stars and Stripes Forever played by the Marine Corps Band. This composition is the official National March of the United States of America: http://www.youtube.com/watch?v=a-7XWhyvIpE.